There are certain requirements that are necessary for any Boy Scout who wants to attain the rank of Eagle Scout. The pathway to Eagle includes first achieving the ranks of Scout, Tenderfoot, 2nd Class, 1st Class, Star and Life Scout while successfully carrying out certain leadership positions along the way. The final leadership challenge is the planning and management of an Eagle Project. At the meeting of Chester Troop 36 on Feb. 8, the Scouts began the process of achieving one of those “Eagle Required” merit badges. Merit Badge Counselor John Goolsby held the first session for the Merit Badge “Citizenship in the Nation” as they discussed the basics of the United States government including the Declaration of Independence, the Constitution and it’s preamble and the Bill of Rights just to name a few. During the ensuing weeks they will research and learn about the branches of government and how laws are made and enforced and the rights that accompany citizenship. Also covered in the curriculum are topics like how the government is financed, government functions and the relationship between federal and state government. They will also visit different agencies to see first hand how federal departments impact our community. 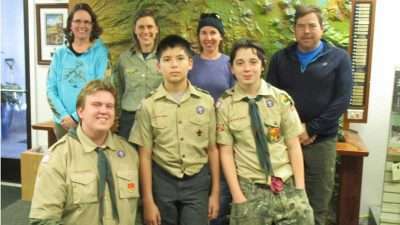 On the troop’s first visit to the U.S. Forest Service Almanor Ranger District office on Feb. 15, the Scouts talked with several members of the staff about the numerous functions their office fulfills in our back yard, the Lassen National Forest. Wildlife Biologist Wes (Gordon) Watts described some of the indigenous animals in our area and showed the scouts trail-cam photos of some not-so-commonly seen species. He also related how he coordinates with the forestry personnel to insure proper habitat for animals, fish and birds. Wes also happens to be an Eagle Scout and shared some of his fond memories in scouting. Another wildlife biologist who specializes in botany is Kirsten Bovee. She described her function to make sure many plants other than “the trees” are not lost as the result of human or government interaction in the forest. Did you know that California has the most unique plants that are not found anywhere else in the world? Foresters Heidi Van Gieson and Matt Cerney explained some of the planning process for prepping fuel reductions in the forest and restoring areas that have been destroyed by fire, respectively. Stacy Kronner is the coordinator for all aspects of recreation in the district. Everything from campgrounds and trails to off-road and snow machine access are under her purview and she talked about the many staff members that try to ensure quality venues for the public. The Scouts then moved from the main office to another building that is the Fire Direction Office for the district. There they met Brigitte Foster and Jennifer Erickson who gave them an overview of the fire prevention, fire suppression and fuels reduction responsibilities of the district. The Scouts also learned about the 22 fires (mostly lightening strikes) that were in the Almanor District last year and how rapid response minimized the damage to the forest. The USFS is just one of the agencies under the direction of the U.S. Department of Agriculture and the visit gave a small glimpse of the vast influence our national government has in our daily lives. “Citizenship in the Nation” teaches the Scouts how to recognize and have a positive impact on that influence which falls under the category of responsibilities of citizenship. As defined by the U.S. Citizenship and Immigration Services, those responsibilities include: support and defend the Constitution, stay informed of the issues affecting your community, participate in the democratic process — vote, respect and obey all laws, respect the rights, beliefs and opinions of others, participate in your local community, pay your taxes honestly, serve jury duty when called and defend your country if the need should arise. There will be more instructional field trips to come in conjunction with the workbook lessons to learn about the many rights and responsibilities of U.S. citizenship. Please contact me regarding your program, Troop 36, I’m an Eagle Scout in Portola, and conducted Eagle Boards for years, glad to help you!!! !